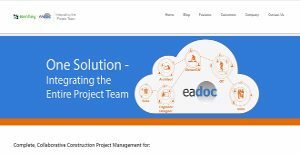 EADOC is an online platform that offers a complete, collaborative construction project management to its users. It is specially offered for construction managers and facility owners to help them do their work faster and more efficiently, and comes with an intuitive interface that is easy to use unlike traditional construction management applications. EADOC prides itself of being the first and only application that allows for true collaboration across a capital project’s entire project team, as well as integrating cost controls with document management. This innovation has allowed customers to reduce project delays, as well as rework and overhead costs on their capital projects. EADOC can be used both during the design and construction phase for managing construction projects and information. It benefits from having a software that uses a “pure web application” technology, which means every page loads quickly, even in the field on wireless connections, making access easier and better for all members, anytime, anywhere. This entails that EADOC hosts the application for you so there is no need for expensive hardware or software to be bought or maintained in the first place. With its built-in SSL encryption, you are ensured that information stored in the system is secure. It is also built using a “pure web application” technology, which means every page loads quickly, even in the field on wireless connections. Custom reports can be generated to determine accountability, especially with certain aspects of the project since you get a better overview of which project member is in charge of such. In addition, EADOC offers easy navigation, while the search features allow for quick lookup of documents, providing for improved productivity. Productivity improvements also extend to the improvement of the document process flow and administration. Everything is done online and in real-time, eliminating as well the costs and effort that usually are associated with traditional construction project management. If you are interested in EADOC it may also be beneficial to check out other subcategories of Best Construction Management Software gathered in our database of SaaS software reviews. Every enterprise has its own characteristics, and can require a specific Construction Management Software solution that will be fit for their business size, type of clients and staff and even individual niche they deal with. You should not count on getting a perfect app that will work for every business regardless of their background is. It may be a good idea to read a few EADOC reviews first and even then you should keep in mind what the software is supposed to do for your company and your staff. Do you require an easy and straightforward service with only basic functions? Will you actually make use of the complex functionalities needed by experts and big enterprises? Are there any specific tools that are especially practical for the industry you work in? If you ask yourself these questions it will be much easier to find a reliable software that will fit your budget. How Much Does EADOC Cost? EADOC pricing is available only on quote basis. Contact the company for more information. We realize that when you make a decision to buy Construction Management Software it’s important not only to see how experts evaluate it in their reviews, but also to find out if the real people and companies that buy it are actually satisfied with the product. That’s why we’ve created our behavior-based Customer Satisfaction Algorithm™ that gathers customer reviews, comments and EADOC reviews across a wide range of social media sites. The data is then presented in an easy to digest form showing how many people had positive and negative experience with EADOC. With that information at hand you should be equipped to make an informed buying decision that you won’t regret. What are EADOC pricing details? What integrations are available for EADOC? If you need more information about EADOC or you simply have a question let us know what you need and we’ll forward your request directly to the vendor.